Photo by Happosai taken in July! 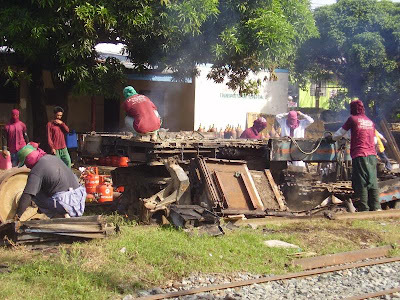 As a rollingstock researcher I was very interested in Happ's piccies the other day of PNR rollingstock being violated by scrappers torches, missing their chances at preservation. The question now arises as to which they were.As of June, when I was there, the following 7A types still existed. It is believed that 7A members were the basis of this violation, which is surprising as the CMC/CTC were next in line (unless of course all these have already been done). In coming days I shall be narrowing the list of suspects - if anyone else can help, please email me. 2001 - Believed to be one of the current scrappings! 2002 - Likely being scrapped. 2005 - Believed to be one of the current scrappings! 2017 - Believed slated for repair at Manila. 2020 - Likely being scrapped. 2026 - Likely being scrapped. 2027 - Believed scrapped in July before inaugeration. 2030 - Believed slated for repair at Tayuman. Have to continue researching it tomorrow.